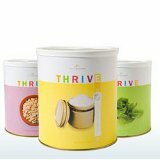 I get a lot of questions about Thrive Instant milk. Instant milk is designed for drinking. It is easy to mix up and easier to drink then powdered milk. Hopefully this chart will help you better understand Instant Milk. Thanks Elise for sharing!